Clinton Merrick Hurdle (born July 30, 1957) is an American former professional baseball outfielder and current manager of the Pittsburgh Pirates of Major League Baseball. Hurdle played in MLB for the Kansas City Royals, Cincinnati Reds, New York Mets, and St. Louis Cardinals, and has also managed for the Colorado Rockies. Hurdle was labeled a "phenom" by Sports Illustrated at age twenty. After retiring from playing baseball, Hurdle became a manager. His eight seasons with the Colorado Rockies included leading the 2007 club to the franchise's first National League (NL) pennant. On November 14, 2010, the Pirates hired him to be their manager. In 2013, Hurdle led them to their first winning season and playoff appearance since 1992. He was named the NL Manager of the Year that season. Clint Hurdle is named for his father, Clinton, who played collegiate baseball for Ferris State University. When Hurdle was four years old, the family moved from Michigan to Florida so his father could take a job at the Kennedy Space Center. Hurdle graduated from Merritt Island High School in Merritt Island, Florida. He received a scholarship from the University of Miami to play college baseball and college football as a quarterback. Hurdle is married to third wife Karla and has three children; daughter Madison (who was born in 2002 and has Prader-Willi Syndrome), son Christian (who was born in 2004), and daughter Ashley (who was born in 1985 and is from a previous marriage). Hurdle is a recovering alcoholic. The Kansas City Royals selected Hurdle in the first round, with the ninth overall selection, of the 1975 Major League Baseball draft. He signed with the Royals, receiving a $50,000 signing bonus. He made his major league debut with the Royals in 1977, and in 1978 was featured on the cover of Sports Illustrated on March 20 with the headline: "This Year's Phenom." Hurdle played for the Royals through 1981, but never achieved the level of play suggested by his high draft position. Playing regularly only in 1978 and 1980, he was traded to the Cincinnati Reds in December 1981, and after spending 1982 with the Reds, went on waivers to join the New York Mets (1983, 1985) and St. Louis Cardinals (1986) before ending his career with the Mets in 1987. Throughout his career, he also played first base, third base, catcher, and designated hitter. After ending his playing career in 1987, Hurdle began his managerial career the next year when he was named Manager of the St. Lucie Mets of the Class A-Advanced Florida State League in 1988. He also served as Manager for the Jackson Mets of the Class AA Texas League (1990), Williamsport Bills of the Class AA Eastern League (1991), and the Tidewater/Norfolk Tides of the Class AAA International League (1992–1993). In 1994 he joined the Colorado Rockies organization as the minor league hitting instructor, serving in that capacity until he was named the Rockies hitting coach in 1997. 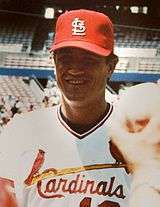 Hurdle was promoted to Manager in 2002 following the early-season firing of Buddy Bell. On April 2, 2006, he was given a two-year contract extension. In 2007, Hurdle managed Colorado to their second best finish in the team's 15-year history (only topped by the 2009 season) by winning 13 out of the last 14 games in order to force a tie-breaker game with the San Diego Padres to determine the winner of the National League Wild Card. Colorado defeated San Diego, reaching the playoffs for only the second time in Rockies history. Hurdle's Rockies then beat the Philadelphia Phillies in the Division Series, sweeping them in three games to force a match-up with their rival Arizona Diamondbacks in the NLCS. The Rockies continued their improbable streak by sweeping Arizona in four games to win the first pennant in team history and reach the 2007 World Series. In the World Series, Colorado faced the Boston Red Sox. But the winning ways came to an end, and the Rockies were swept in four games. Injuries to several regulars caused the Rockies to fade in 2008, and after a poor start in 2009, Hurdle was fired on May 29. Although Hurdle was offered a "significant role" within the Rockies organization, he decided to join the MLB Network as a studio analyst for the remainder of 2009. He finished with a 534–625 win–loss record. On November 4, 2009, he was hired as the hitting coach for the Texas Rangers. The Rangers hoped that Hurdle could connect with Josh Hamilton, who also suffered from substance abuse. In 2010, Hurdle helped the Rangers to their first American League pennant in franchise history before losing to the San Francisco Giants in the 2010 World Series. 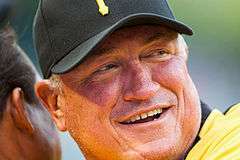 After interviewing with both the Pittsburgh Pirates and New York Mets for their vacant managerial positions, Hurdle was hired by the Pirates on November 14, 2010, after they fired John Russell. Hurdle then agreed to a three-year contract, keeping him with the team through the 2013 season. At the 2011 All-Star break, Hurdle had led the Pirates to a 47–43 record, one game out of first place in the NL Central. It was the first time the Pirates had been over .500 going into the All-Star break since winning the 1992 National League East. At the 2012 All-Star break, Hurdle had led the Pirates to a 48–37 record, leading the NL Central division by 1 game over the Cincinnati Reds. However, both seasons ended with collapses that led to the Pirates 19th and 20th straight losing seasons. During parts of the 2013 season, the Pirates led the National League Central, with the best record in the major leagues, again aiming to snap the franchise's long losing streak. On September 9, 2013 with a 1–0 win over the Texas Rangers Clint Hurdle's Pittsburgh Pirates attained win number 82. On September 23, 2013 with a 2–1 win over the Chicago Cubs and a win by the St. Louis Cardinals over the Washington Nationals, the Pittsburgh Pirates secured their first playoff berth since 1992 as well as their 90th win. Under Hurdle, the Pirates would finish the 2013 season with a record of 94 wins and 68 losses, 3 games behind the NL Central division winning Cardinals. In the playoffs, the Pirates won the 2013 National League Wild Card Game against the Reds but would lose the deciding game 5 against the Cardinals in the 2013 National League Division Series. Hurdle won the National League Sporting News Manager of the Year Award in 2013. In 2014, the Pirates would again clinch a playoff berth with a record of 88 wins and 74 losses to make a second straight appearance in the Wild Card game. The Pirates lost the 2014 National League Wild Card Game to the eventual World Series champion San Francisco Giants. In 2015 the Pirates again made the postseason as one of the National League wild card teams with a 98–64 record, the second best record of any team that season. The Pirates lost the 2015 National League Wild Card Game to the Chicago Cubs. 1 2 Keith, Larry (March 20, 1978). "The eternal hopefuls of spring". Sports Illustrated. p. 20. ↑ Arangue, Jorge (October 23, 2007). "From rocky past to Rockies success". Retrieved October 24, 2007. 1 2 3 Nesbitt, Stephen J. "Note to self: Before Clint Hurdle was a wise manager, he was a cocky prospect. The lessons learned in that time made him a leader". Pittsburgh Post-Gazette. Retrieved March 31, 2016. ↑ Michaelis, Vicki (September 12, 2007). "Clint Hurdle balances family concerns with baseball". USA Today. Retrieved October 20, 2007. ↑ Svrluga, Barry (October 23, 2007). "Hurdle Manages to Find Way Through Difficulties". Washington Post. Retrieved July 17, 2012. ↑ "SI Flashback: This Year's Phenom". CNN. October 23, 2007. Retrieved April 30, 2010. ↑ "Francona y Hurdle son producto del Caribe". ↑ Harding, Thomas (April 7, 2007). "O'Dowd, Hurdle extended for two years". USA Today. Retrieved April 19, 2007. ↑ "Clint Hurdle". Baseball-Reference.com. Retrieved March 31, 2016. 1 2 "Clint Hurdle". Baseball Reference. Sports Reference LLC. Retrieved December 17, 2014. ↑ "Hurdle named Rangers hitting coach". Texas Rangers. Retrieved March 31, 2016. ↑ "Archived copy". Archived from the original on November 12, 2010. Retrieved November 10, 2010. ↑ "Pirates tap Hurdle as new manager". Major League Baseball. Retrieved March 31, 2016.